As club meeting we call our monthly meeting. This is on every third Thursday of the month. Meeting place is the restaurant "Tante Anna" at the Kölner Landstraße 370 in 40589 Düsseldorf-Holthausen. Guests are welcome here. General discussion on a club meeting. 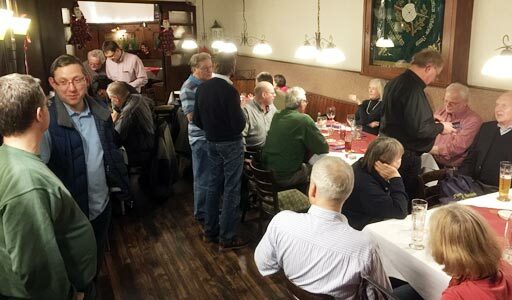 The next local club's meeting is on May 16, 2019 at 8:00 pm. The most members are already several minutes before the official start at the restaurant: mostly to order one of the delicious meals from the card. The club meetings begin at 8 pm with an official part, during we talk about updates and about the past and future events - occasionally there will also hear a lecture. After that there is also the opportunity to chat. At about 9:30 pm the first begin to compete for home, and then until 10:30 pm make the last on the way. The club meeting in December begins at 7 pm. This evening our traditional kale meal takes place. Experience has shown that many members come, which for business or other reasons can't come otherwise. To participate in the kale meal a registration is required.